Follow the steps of this page to get started with Ozeki VoIP SIP SDK and SureVoIP. SureVoIP is an Ofcom registered Internet Telephony Service Provider supplying hosted VoIP solutions, SIP trunks, Inbound numbers and other related VoIP products and services in the UK. First need to download Ozeki VoIP SIP SDK and then follow the configuration steps of this page for efficient operation. Figure 1 shows you the cooperation between Ozeki VoIP SIP SDK and SureVoIP. After you have configured the connection, your system is ready to start your calls and build your own application with VoIP support using SureVoIP. The call can be made to a mobile phone or a landline phone. Before you begin to follow the configuration steps of this guide, it is assumed that you have already downloaded Ozeki VoIP SIP SDK from the download page and installed it into your computer. Also, it is assumed that you already have a VoIP account at SureVoIP. You can easily register a VoIP account by contacting SureVoIP at http://www.surevoip.co.uk/contact-surevoip. Once you have installed Ozeki VoIP SIP SDK into your computer, the Demo Application will also be installed. Launch the Demo application and provide your SureVoIP SIP account details into the SIP Account Settings tab. You got this details from SureVoIP via e-mail. After this, click on Register (Figure 2). The Demo Application will register to SureVoIP. After the registration, a Phone Line will be created. You can see the created Phone Line at the Phone Lines section of the Demo Application. Dial a phone number, and click on Pick up (Figure 3). At the destination phone you can see an incoming call from Ozeki VoIP SIP SDK via SureVoIP (Figure 4). The state of the call will be changed to InCall. 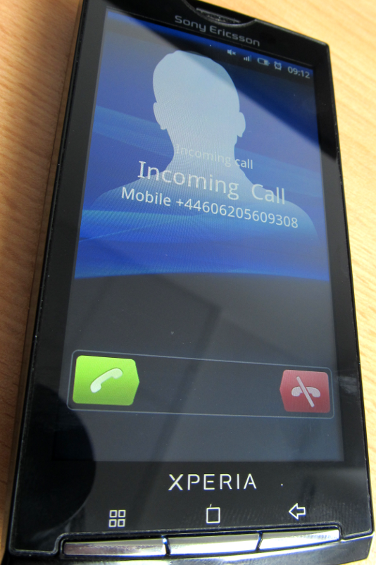 The active phone call will be visible at the Phone Calls section (Figure 5). Ozeki VoIP SIP SDK is a powerful tool can be used easily in your own solution to create your own VoIP-enabled applications. If you followed the steps of this guide, you have a working system with SureVoIP support. If you have any questions do not hesitate to contact us at info@voip-sip-sdk.com.